Here is a quick test of your graph reading skills. 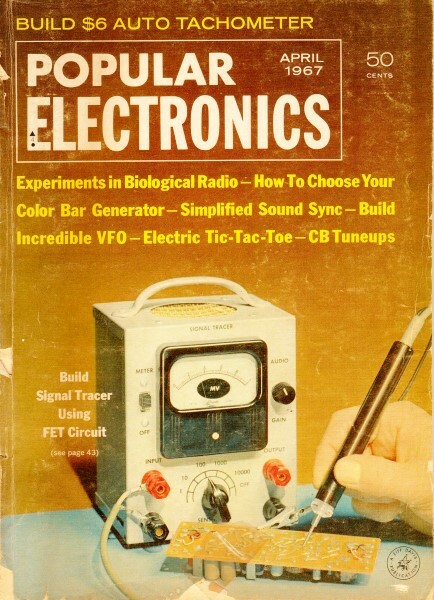 It appeared in the April 1967 edition of Popular Electronics. I missed #6 - a temporary (hopefully) case of cranial rectumitis on my part. Maybe you will do better. Today's front-line electronic technician must be able to interpret readily the various charts and graphs devised by engineers to convey important information on the electrical characteristics of circuits as well as of individual components. In addition, the technician must be thoroughly familiar with the origin and composition of a variety of unusual as well as standard oscillographic waveforms. Test your ability to interpret the graphs and waveforms shown below (1-10) by selecting the most likely meaning, (A) or (B), from the two possibilities given in each case. 1. 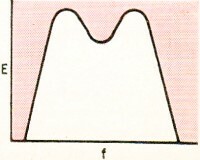 The family of plate characteristic curves for a triode shows that as the plate voltage is increased the a.c. plate resistance (A) increases or (B) decreases. 2. 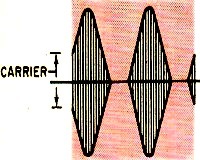 The distortion seen in this square-wave test signal indicates that the amplifier being tested is attenuating the (A) low frequencies or (B) high frequencies. 3. The collector current vs. base current curve for a transistor indicates that as the base current is increased the beta (gain) of the transistor (A) increases or (B) decreases. 5. 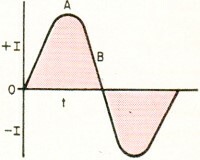 Output curves show that as a transistor's collector voltage increases, the a.c. output resistance (A) increases or (B) decreases. 6. 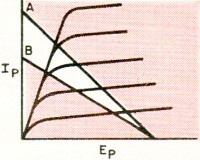 Vacuum-tube mutual transconductance curve indicates that as grid bias is increased mutual transconductance, Gm, (A) increases or (B) decreases. 7. Of the two load lines, (A) and (B), shown in the graph at right, which one represents the larger value of load resistance? 8. 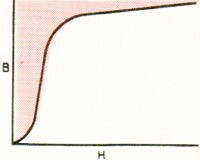 The magnetization curve for a transformer core material shows that as the core goes into saturation its permeability (A) increases or (B) decreases. 9. The rate of change of a current depicted by a sine wave is greatest when the current is at its peak (A), or (B) when it is passing through 0. 10. This frequency response curve for a tuned transformer indicates that the windings are (A) over-coupled or (B) under-coupled. 1 - B The slope of these curves represents the ratio Ip/Ep, or conductance (the reciprocal of resistance). As the plate voltage is increased, the slope and conductance also increase, and the resistance decreases. 2 - A The fundamental and low-frequency components of a square wave contribute chiefly to the center portion of its flat top. Thus, if an amplifier under test attenuates the low frequencies, a dip appears in the center of the square-wave test signal. 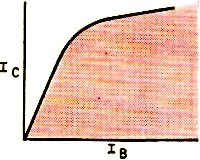 3 - B The slope of this curve represents the ratio lc/IB, or beta, the current gain of a transistor. 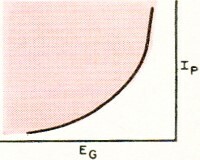 As the base current increases, the slope of the curve and beta decrease. 4 - A Overmodulation can reduce an r.f. 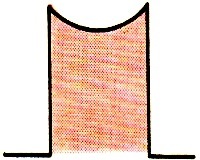 carrier to zero amplitude during a period of time as shown by the thin base line through the modulation envelope. 5 - A The slope of this family of curves indicates changes in the conductance of the transistor. 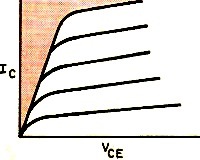 As the collector voltage (VCE) is increased, the slope and conductance decrease, and the resistance increases. 6 - B The slope of this curve represents the ratio Ip/EG, or mutual conductance (Gm) of this vacuum tube. As the grid voltage (Eg) is increased, the slope and Gm decrease. 7 - B The slope of a load line represents the conductance of the load resistance. The load line with the lesser slope (B) shows a lower conductance, or higher resistance. 8 - B The slope of this curve reflects the ratio B/H, the permeability of the core material. 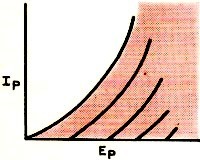 As the curve goes over the knee, the slope and permeability both decrease. 9 - B At its peak amplitude, a sine wave changes from one finite value to another, but as it passes through zero it changes from a finite value to zero, resulting in an infinite percent change. 10 - A When the windings of a tuned air-core transformer are overcoupled, a dip is produced in the center of an otherwise single-peaked frequency-response curve, and two new resonant peaks occur at slightly higher and lower frequencies.